“I met him first in 1954 at Beijing, then again in 1956 when I was invited to attend the 2500th Buddha Jayanti Celebrations in India. By then, the Chinese communists had already begun their brutal crackdown in Tibet. Consequently, my ministers, as well as my brothers, were utterly opposed to my returning to Tibet. They sought to persuade me to stay in India. I discussed this with Nehru, who advised me to return to Tibet. He highlighted certain points in the Seventeen Point Agreement which he felt we could still negotiate with the Chinese. He recommended that I try to do that within Tibet. After narrating his fruitless attempts to negotiate with Chinese officials, His Holiness described Tibetans’ life as refugees in India. Once settled in the freedom and safety of India, His Holiness and his former ministers made every effort to raise the issue of Tibet at the United Nations. “Although the resolutions passed by the UN brought no concrete results inside Tibet, the second resolution asserted the ‘Tibetan people’s right to self-determination’. His Holiness explained that he had first begun to think about the Middle Way Approach in 1974, ideas that paved the way for his elder brother’s eventual meeting with Deng Xiaoping. His Holiness went on to emphasize the importance of keeping Tibetan Buddhist traditions alive because of their unique and scientific approach to reality. He added that maintaining a working knowledge of literary Tibetan was crucial to this. 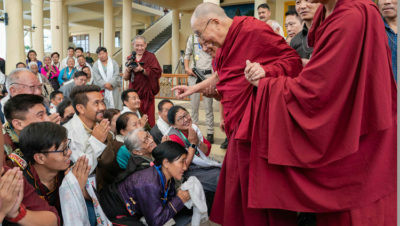 Reiterating his commitment to promoting the idea of the oneness of humanity, His Holiness asked how it would be if this were not to include the Chinese people. He stressed the importance of building friendly relations with the Chinese, while at the same time upholding Tibetan unity.